The Boy turned seven last Sunday. Unlike his sister, whose trip from four to five seemed like a slow, multi-stop cruise, The Boy's birthday was more bullet train. My lovely wife made cupcakes for his classmates the Friday before, but the handing out and eating of them during school snack time for the most part involved being outside and devouring and yelling. And then it was Saturday, with its little league game and swimming lessons and growing feeling that we were not quite ready. Then it was Saturday night, with my wife out rounding up the rest of the books for takeaway gifts while I soldered the last of the wire. Then Sunday morning tennis lessons and yoga for kids. Then the party. Given the success and fun of Q's party, we decided to again have a small number of kids over to our apartment to celebrate The Boy. We whittled his list until together we settled on inviting eight kids, which meant (given siblings), we'd be looking at 13 kids total. Doable. Probably. The main activity was mainly my idea. I'm a fan of the maker's movement and had seen in some post or other an idea for building a simple robot, called a vibrabot, out of household stuff. It consists of a small motor (from one of those small plastic fans) attached to a tin box of some sort, supported by thin metal legs. When attached to a AA battery, it spins an offset paper clip or bobby pin and "walks" around a reasonably smooth surface. It's pretty cool to bring something like this to life, and The Boy, who enjoys designing and making things in general, really loved making a prototype. It seemed like a good project for a room of seven-year-old boys. The Boy and I did the difficult and dangerous stuff beforehand. I held the Phillips screwdriver as he hammered holes in the tin boxes to thread wire through. 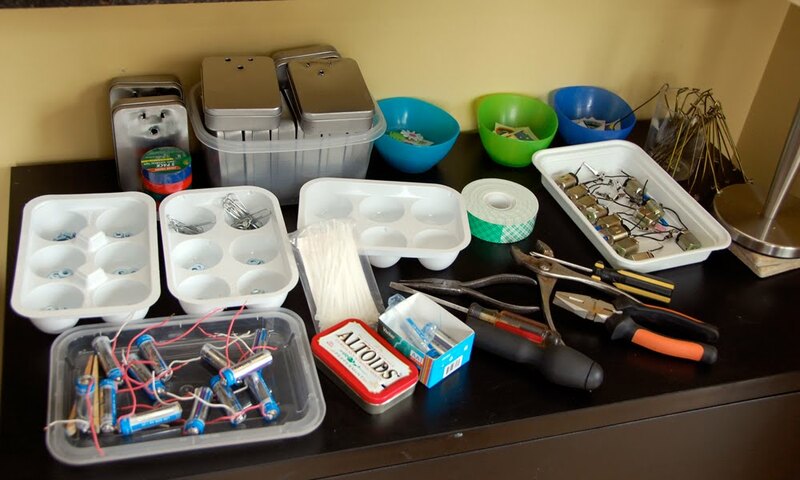 He held the solder spool as I joined wires to motors and batteries, and alligator clips to wires. 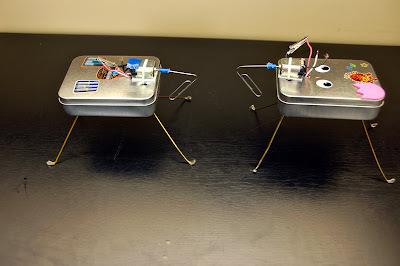 At the party, then, kids would just have to attach motors to the boxes with cable ties, tape batteries to the inside, connect up the wires, and attach the legs with small nuts and bolts. in something like an hour. With 13 kids. In our apartment. Sure, it was a lot, but I wanted each kid to enjoy the making as much as the having. It almost worked. Some kids were able to get their bots together with just a little instruction, but several couldn't. A few played with their wires until the solder or the wire broke, or they worked newly attached legs until the bolts came loose. While cake was being eaten, I worked so that all but two kids (I think) left with working machines, and those two left with promises to get theirs working sometime soon. (Note the actual working lights on either side of the "M7.") My wife continues to impress and amaze, and the kids have noticed. 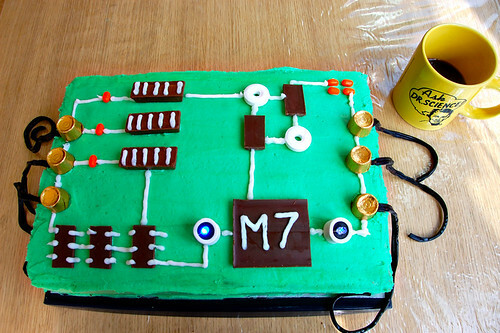 When she expressed worry about getting the cake to look like a circuit board, my son said, "You can do it, mom. You can do anything." And she can, I swear. Growing up, my father and I shared a language of work, spoken in hands and tools. Some of my favorite moments with him were spent looking over the underside of a lawnmower or re-screening a door. Though I'm sure I often came along to fetch and hold (that's what kids are for, after all), he honored me with these quiet conversations. I probably talk too much when my son or daughter and I make and do things together — I'm pretty sure I think too much — but I want them to learn the grammar of work, to have their hands become familiar with a vocabulary of tools. And I want to have another thing in common between us that goes without saying. After everyone had left and The Boy had opened his presents, the wind picked up from the west, and a mean-looking bank of clouds unfurled toward us over the river. The phone rang, and I answered it, but the line seemed empty. Then a boy from the party softly said, "There's a problem with the robot." That's okay. We can fix it. Happy birthday to the Boy! I am most impressed with the cake. Your wife can do everything! And has a full-time job outside of the home as well?!? Superwoman! And I can't help but ask - do your kids really take a yoga class as well? I guess it's never too early to get good training for stress relief.